Tuesdays and Thursdays from 10am - 12pm in room 104. You may have been a disciple of Jesus for many years or may have decided more recently to take that first leap-of-faith step. Maybe it was a decision to start a closer, more obedient walk. No Matter which path you took, you were created by a passionate God who relentlessly pursued you to bring you into His family. Welcome home! 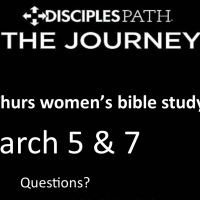 Over the course of this study, Disciples Path: The Journey, we'll explore Biblical stories of disciple-making and replication in order to gain a better understand of what it means to follow Christ. We'll explore what it means to be obedient, effective disciple of Jesus (read Matthew 28:18-20). The Disciples Path is an intentional plan for discipleship that provides a purposeful process for maturing in Christ. Both new and seasoned disciples will encounter key ideas and practices to help them (you) grow in Christ and mature as disciple makers. Will you take advantage of this life-changing opportunity to advance God's Kingdom in your family, your church, your community?